Whether you have a traditional, rustic or modern living room, living rooms with earth tones offer a warm and cozy feeling. If you are looking for a living room that feels as comfortable as it is beautiful, you’ll enjoy browsing through these 21 living rooms with earth tones for ideas. You can add earth tones to your living room in many different ways…your flooring choice (wood, tile or carpet), your wall color and texture, your furniture and fabric selection, your fireplace (wood or stone) and the accent pieces you decide to bring in your living room. Earth tones are all inspired by mother nature. What a beautiful spirit to bring into your living room — how can you go wrong with that! Browns call for the color of the fertile soil that brings us our food. Muted greens remind us of the beauty of plant life such as the ageless olive trees of the Mediterranean coast. Ochre yellows bring the warmth and solace of priceless sunsets inside while cream or light beige tones marry it all together. 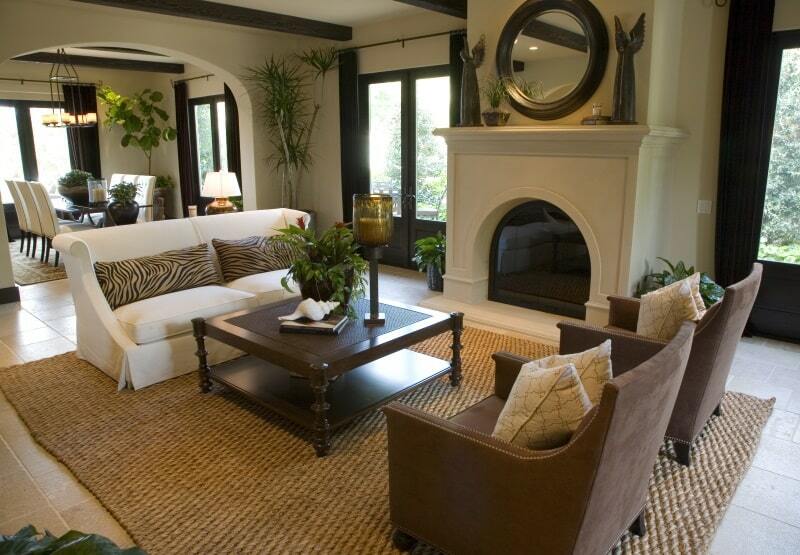 A beautiful way to enhance the earth tone color palette of your living room decor is to invite in nature itself. 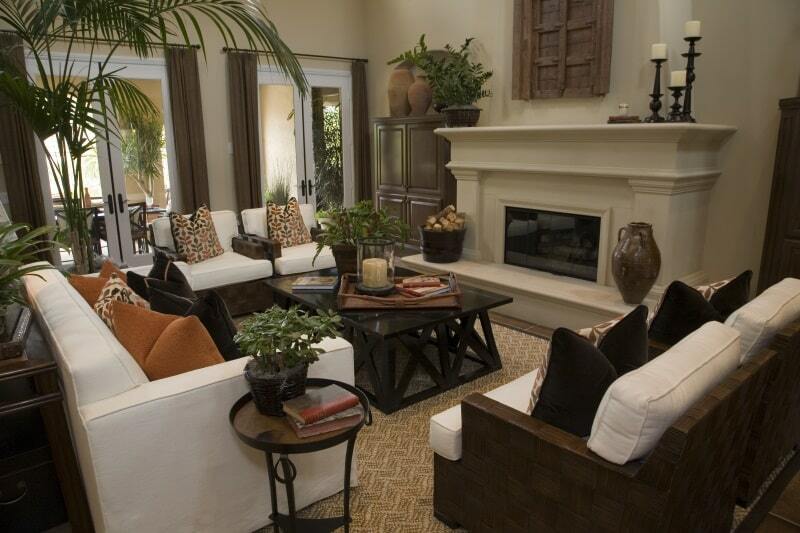 For example, a basket with real firewood is a great complement to living rooms with earth tones. You can also bring a dwarf lemon tree inside (our favorite is Meyer lemon trees). This live accent piece with brown, green and yellow hues is so rich and the lemon fragrance is amazing! So to add comfort charm to your living room with colors, check our living rooms with earth tones photos below for living room designs inspiration and decoration ideas. Enjoy and beautiful day to you! The Little Plus: definitely the indoor wrought iron bridge with wood framing with matching balcony no less — wow! The Little Plus: the porcelain lamp with salmon shade gives this living room with gorgeous earth tones a dash of color — very nice accent that stands at the corner of the living room space as if she wanted to tell a story. And notice how in this open space concept, the living room in the front, dining room in the middle, and kitchen in the back live in perfect harmony — all while enjoying a beautiful patio view, lovely! 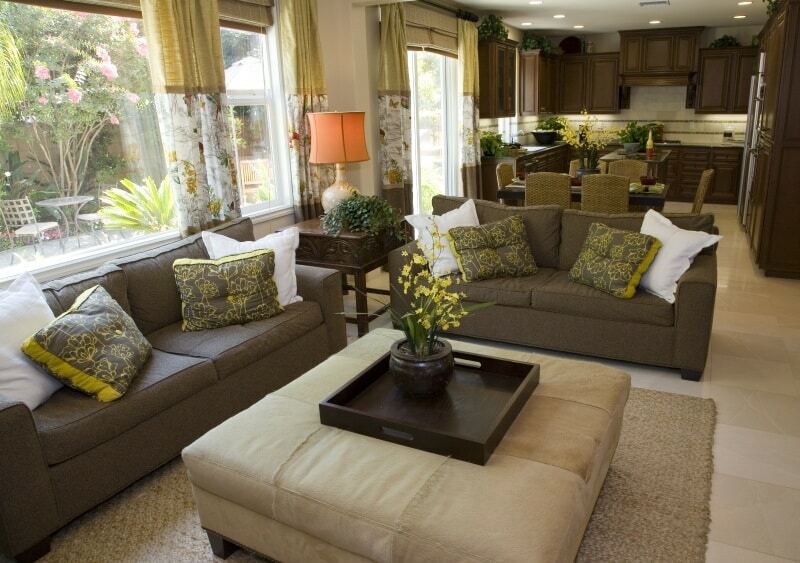 The Little Plus: the built-in cabinets glass door design matching the living room windows on top. Also, the fireplace with stone mantel and the firebox with beautiful herringbone brick pattern add flare to this relatively small but cozy living room space. 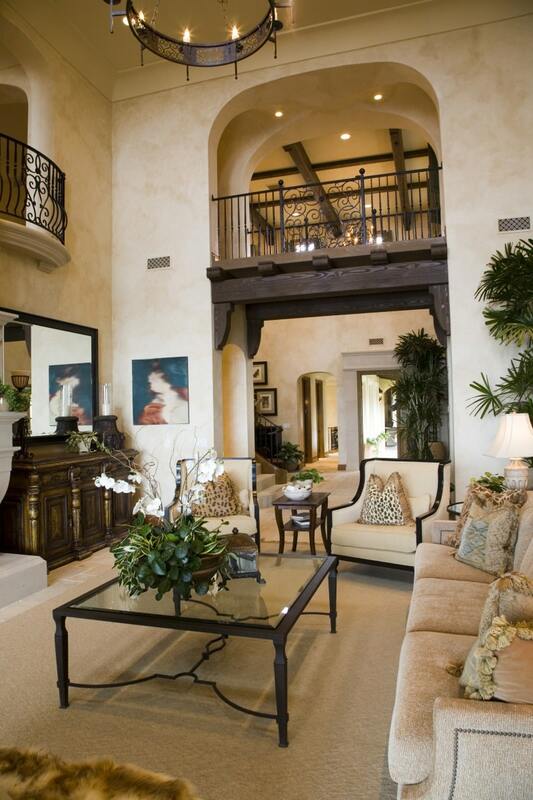 The Little Plus: the raised stone fireplace that reigns over this beautifully arranged living room. The wood armoire on its side is a great companion in style. The Little Plus: the twin armchairs framing the custom built stone fireplace. 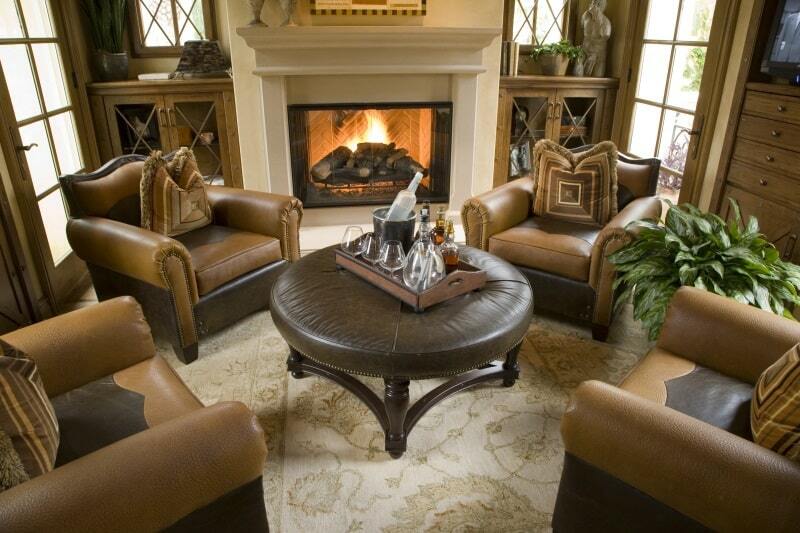 Their dark wood feet offer a gentle contrast with the beige carpet and call the brown leather L-shaped sofa. The Little Plus: the tile flooring with a rich variation of earth tone colors. Elegant and simple creamy white love seats on a dark brown rug define a cozy space dedicated to relaxing, chatting, or enjoying a digestif after a special dinner. The Little Plus: the wrought iron chandelier overseeing discussions at the coffee table. Love the harmonious marriage of olive, brown and taupe colors. 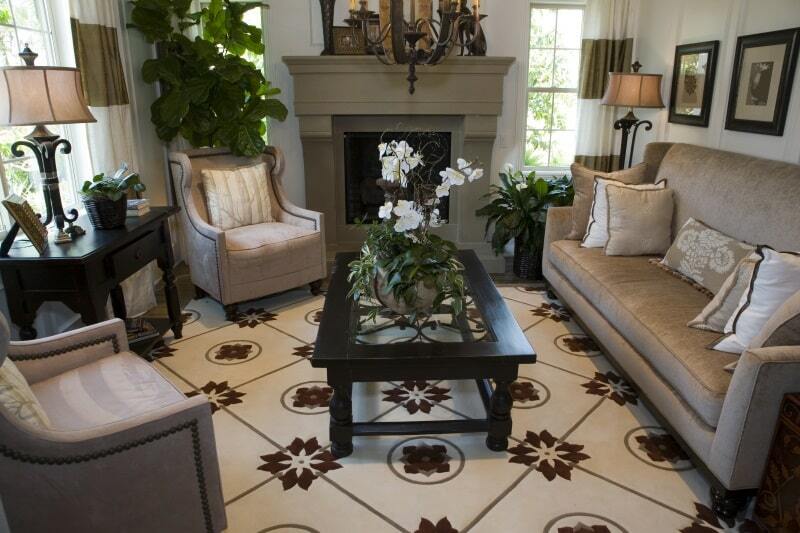 Also, notice how the beautiful rug pattern adds a touch of sophistication.